Elusive otters exhibit playful antics in Texas rivers. “It’s a good day when you get to see a river otter,” a good friend of mine contends, but catching a glimpse of these elusive creatures is no easy task. I recently stumbled upon one such opportunity while out enjoying — or, more honestly, enduring — a jog. I was on the home stretch — about the time that my labored breathing began affecting my vision — when an animal caught my eye. Many questions raced through my clouded mind as I tried to determine what was heading toward me. In my fatigued state, I even went as far as to secretly hope the beast might overtake me and end my suffering. Then I realized it was … an otter? My suspicions were affirmed as the otter spotted me and bounded off through the tall grass. I’ll admit I was hesitant to believe what my eyes had seen, but it was undeniably a close encounter with a river otter. River otters (Lutra canadensis) inhabit the eastern half of Texas, and are, as their name implies, generally associated with water. However, they also spend a considerable amount of time on land. Their long, lean bodies and undulating gait appear awkward on dry ground, but make no mistake, once this creature slides into the water, it has entered its domain. Otters have webbed hind feet, ears and nostrils that can be closed underwater, and a long, tapered tail that aids in their aquatic escapades. River otters are masterful swimmers and divers, and can hold their breath for up to eight minutes. Otters can live a decade, grow to four feet long and weigh up to 20 pounds. They are well known for their playful antics, and are often observed slipping, flipping and sliding into the water. They are active throughout the year but are seldom seen because of their secretive, mostly nocturnal nature. Otter dens are typically located near water and have two entrances, one on land and one submerged. They are not finicky eaters; their diet consists mainly of fish, crustaceans, mollusks, amphibians and invertebrates. Otters normally mate in the water and produce an average of two to three pups per litter. Pups are born about 10 inches long, blind, toothless and fully furred. At one month they can open their eyes; after four months they are fully weaned, waterproof and ready to face the world. Once heavily trapped for their pelts, river otter populations are now believed to be expanding in Texas. This is welcome news to those wishing to have their very own close encounter. 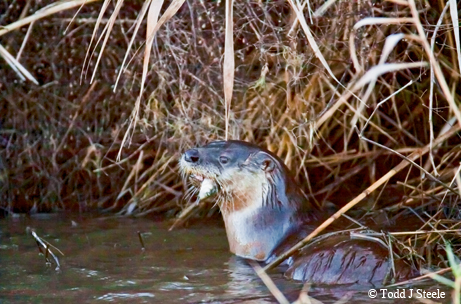 It is definitely a good day when you get to see a river otter.